The United Arab Emirates (UAE) is home to a wide range of universities, both public and private. The UAE has established an excellent and diversified system of higher education in a very short period of time. The Ministry of Education established the Commission for Academic Accreditation (CAA) to conduct a program of licensure of institutions of higher education and accreditation of each of their academic programs. The mission of CAA is to promote educational excellence across diverse institutions of higher learning in the UAE. Through licensure of colleges and universities, and accreditation of individual programs, the Commission strives to assure high quality education, consistent with international standards. The ten standards of excellence and the criteria that all institutions must meet for licensure and program accreditation provide measures of quality and also reflect a consensus within the international higher education community about the essential characteristics of institutions that achieve a level of excellence and continuously improve. As a result, students, graduates, their families, and the UAE public can be confident that licensed institutions and accredited programs will provide the high quality of higher education that they expect and deserve. To find out more about licensed institutions of higher education in the UAE, please refer to the Commission for Academic Accreditation. UAE higher education institutions can be divided into three categories: Public, private, and Global Partnerships. UAE University (UAEU), where enrollment has increased from 502 in its founding year (1977) to nearly 14,740 in 2006. Women represent 79% of the student body. UAE University awards 70 undergraduate degrees as well as some graduate degrees. Many of its programs are internationally accredited. Zayed University (ZU), established in 1998 as an all-women’s institution, and later expanded to include men. Organized into five colleges — Arts and Sciences, Business Sciences, Communication and Media Sciences, Education, and Information Systems. The primary language of instruction is English. Higher Colleges of Technology (HCT), the largest higher educational institution with an enrollment of over 18,000 UAE nationals. Founded in 1988 with four campuses. HCT now includes 16 men’s and women’s colleges in Abu Dhabi, Al Ain, Madinat Zayed, Dubai, Ras al-Khaimah, Sharjah and Fujairah. The colleges offer more than 80 programs at four different credential levels — Diploma, Higher Diploma, Bachelor and Masters. More than 10,000 of the current students are female. Khalifa University (KU) is an independent, non-profit, coeducational institution inaugurated in 2007 as part of an Abu Dhabi Government initiative. Khalifa University is dedicated to the advancement of learning through teaching and research and to the discovery and application of knowledge. In June 2018 Khalifa University ranked first in the UAE and 315th globally according to the 2019 Quacquarelli Symonds (QS) World University Rankings, placing the university among the top 31% of the 1,011 institutions assessed across the world. American University in Dubai (AUD), which was founded in 1995 as a private, non-sectarian institution of higher learning, serves UAE nationals and international students who seek world-class career-oriented education. American University of Ras Al Khaimah (AURAK), which was established in April 2009, provides high quality American-style undergraduate and graduate education that encourages lifelong learning and professional education; conducts research to serve the RAK Emirate, the UAE, and the greater region to strengthen community and business development; and promotes human capacity to ensure an educated workforce for social and economic progress. American University of Sharjah (AUS), which was founded in 1997, offers 25 majors and 48 minors at the undergraduate level, and 13 master's degrees programs through the its academic divisions. American University in the Emirates (AUE) offers a variety of high-quality accredited academic programs. AUE’s broad range of programs and specializations are offered by five colleges, one institute, and two centers. University of Sharjah (UOS), which was established in October 1997, aims at being a foundation of higher education utilizing the most modern educational means and curriculum. UOS is comprised of 14 colleges, which offer diverse academic programs of study at the diploma, bachelor’s and master’s levels. The student population at the University has currently reached 8000 with a faculty of 400, which means a faculty member for each 20 students. Ajman University of Science and Technology (AUST), which was founded in 1988 as the Foundation of Ajman University of Science and Technology, has changed its name to Ajman University of Science and Technology since 1996. AUST aims to produce competent and skilled graduates who can be of immediate benefit to society, contributing to its development and well-being. 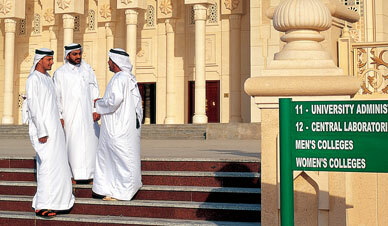 Abu Dhabi University (ADU), which opened its doors in September 2003, offers highly rewarding career oriented undergraduate and graduate degree programs aligned with the needs of UAE and the region through excellence in teaching, student learning, faculty scholarship and engagement in community development. ADU is in a process of continued development with campuses in Abu Dhabi and Al Ain. Al HOSN University, which opened in 2005, started with three faculties — Engineering, Business and Arts and Social Sciences. It will offer a unique set of disciplines, some of which are being introduced for the first time in the UAE. Masdar Institute for Science and Technology (MIST) began accepting students in 2009. MIST will be the Middle East’s first graduate education and research university focused on developing the next generation of solutions to the world’s dependence on fossil fuels. Please refer to the Commission for Academic Accreditation to learn more about licensed institutions of higher education in the UAE. Private institutions are playing an important role in education across the UAE. A high percentage of students in the UAE are enrolled in private schools, e.g. 50% of all students are in private schools in Dubai and 40% in Abu Dhabi. A number of international universities have campuses or programs in the UAE. Some are housed in special zones, including Dubai Knowledge Village and Academic City. These are multi-university complexes that attract students from the region who are unable to go abroad to study. More than 25 universities are located, or planning to be located, in these special Free Zones. The UAE government and the individual Emirates have forged numerous partnerships with US institutions aimed at improving education in the UAE, and promoting exchanges between Western and Arab cultures. Johns Hopkins’ Bloomberg School of Public Health is helping establish a public health doctoral program in the Emirates. New York University is opening a campus in Abu Dhabi, the first comprehensive liberal arts and sciences campus, with a robust research component, to be operated abroad by a major US university. A temporary campus is projected to welcome an initial class of students in the fall of 2010, starting with undergraduates and phasing in graduate students. When the main campus opens on Saadiyat Island, NYU Abu Dhabi is expected to serve over 2,000 undergraduate and graduate students of diverse backgrounds and who will be recruited worldwide. The Massachusetts Institute of Technology is helping create the Masdar Institute of Science and Technology (MIST), the first graduate level, research-driven scientific institution in the region. The Wharton School of the University of Pennsylvania has partnered with Dubai World to create the Dubai Leaders Program. The Rochester Institute of Technology signed an agreement with officials from Dubai to establish a new campus in the Emirate. Since 2005, the New York Institute of Technology (NYIT) has been offering degree programs at the Center of Excellence for Applied Research and Training (CERT) Industrial Park, in Abu Dhabi. In 2007, NYIT became the first American university in the United Arab Emirates licensed by the Ministry of Education and Scientific Research. The Colorado School of Mines and the Abu Dhabi National Oil Company signed a 10-year agreement for the development of the Petroleum Institute in Abu Dhabi, a one-of-a-kind collaboration between industry and academia that will bring world-class educational resources and research to the Gulf. The Sorbonne opened its Abu Dhabi campus in 2006 and will award qualifications under French regulations and standards set by the Sorbonne in Paris.